A Top Ad Annotation displays text regarding the number of user visits to the website over time. For an ad to be eligible for a Top Ad Annotation, the ad must receive a high CTR with a low occurrence of back-button clicks from users. The threshold for when a Top Ad Annotation will appear is dynamic as customer engagement changes over time. 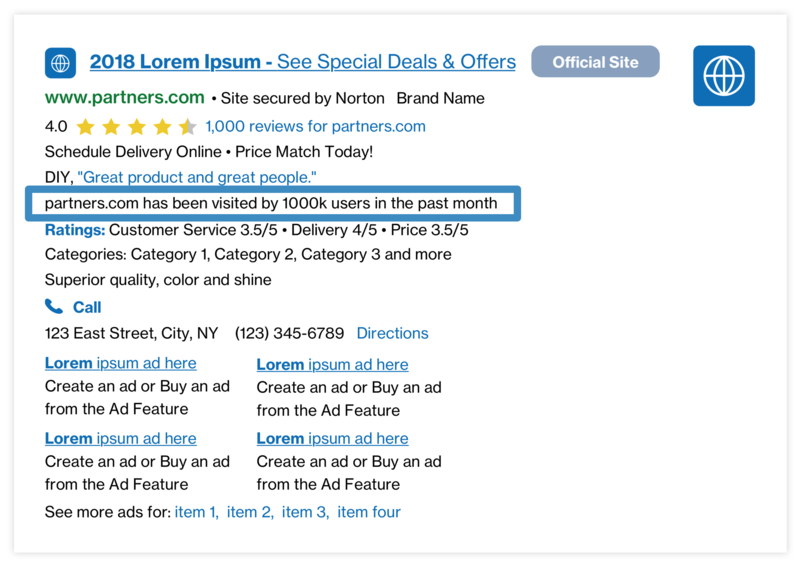 Top Ads are sent with the raw number of visits (i.e.,113804), so Partners need to translate this number (i.e., 113,804) to a round number, like "100K+". Results: Some Partners have seen an estimated lift of +0.9% CTR and 3.6% RPM when combined with Security Badge Annotations and Brand Annotations. Results may vary.